Think Tank 2016 was an event hosted by the Mayor’s Office of Community Empowerment and Opportunity in which students worked in teams to create a presentation about one problem they wish to solve in West Philadelphia—and how. The event features teams from each of the high schools participating in the Promise Corps College and Career Readiness program: West Philadelphia, Overbrook, Parkway West, and School of the Future. Four students from West Philadelphia High School teamed up to propose the opening of a career center and school store. The high school students presented their solutions to a panel of Promise Zone partners which included LISC, the Police Department, Drexel University, the Citizens Planning Institute, the US Department of Housing and Urban Development, Intercultural Family Services, Inc., the Philadelphia Public Health Department. These partners gave productive feedback on how the students might implement the solutions they proposed. 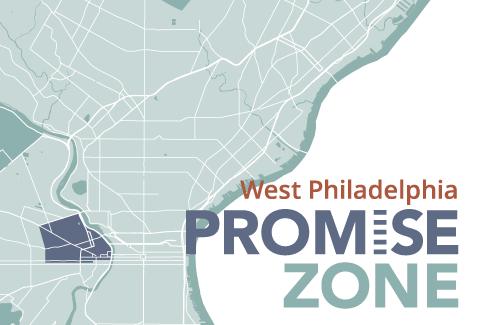 Less than two weeks later, with help from the Promise Corps and school administrators, the students from West Philadelphia high school made their ambitions a reality. They opened the doors for their school store, 49 West, for the first time since 2013. The students’ progress for creating the school store was supported by the principal and some teachers who donated school supplies, uniforms, and gym gear to sell in 49 West. Brittni Collins, Antonio Hanton, Taliya Malone, and Elegria Washington have been staffing the school store during lunch periods since April 4th, and although they still have plans to expand to a career center, they are pleased with the progress they have made thus far. Working at the school store has provided them and other volunteers the chance to earn community service hours while learning the ins and outs of operating a business. Recently, they received approval to operate at the end of the school day, and they are very excited to continue with the project and see what new opportunities lies ahead. The Think Tank students came up with the idea after hearing many of their peers express a desire to own their school store. Participating in the Think Tank was a good platform to work towards getting a school store started. Promise Corps College and Career Ambassadors (CCA) were able to provide significant support to the students, the Think Tank participants said that they “couldn’t do it without them”. The students hope that the school store will eventually become a booming business. They want more uniforms, ties, sweaters and school gear with the school’s logo, and are planning to have fundraisers to get additional items for the store. Some fundraising ideas include selling water-ice and popcorn after school. The students want to have enough in stock to begin the 2016-2017 school year so that students shopping for school supplies will consider 49 West as an option. Students will accept support from any person or organization that wants to contribute to 49 West. Currently, funds are used to restock supplies at the store and to support fundraising activities for 49 West. To donate and support the school store please contact Promise Corps site supervisor. You can get in touch by e-mailing Jenielle Cook at Jenielle.Cook@Phila.gov.